The rumor's are true, Baudis is producing a Pitbull 2. The new F3F model should be ready for production in approx. 2-3 months. It will be called "Pitbull 2". The pricing and details for different versions will be known later, after production and test first prototype. Definitely we would like to use also new materials for the Pitbull 2, so there will be versions with spreadtow carbon and other. Sorry, no more details at the moment. Only that there should be a new upgraded wing-profiles and fuselage. I know Lez has one of the first production models on order, I'll be watching this one closely. Thanks for providing these details Graeme. It sounds a pretty exciting prospect, especially if the airframe demo's new material science and reflects the latest aerodynamics from Dirk Flug. If it builds upon the merits of the original, it'll be an absolute killer - excited to see Les's model during the winter leagues!!! More ballast would be good. Doesn't need more ballast when you use tungsten. I'm looking forward in getting my hands on the new Pitbull,should be a cracking plane. Just need to come up with some colours and design to do it justices. It'll be interesting to see the wing are on this one. Pitbull 2 now pre ordered, hopefully get it before Christmas looking forward in seeing the different layups on offer, I like the idea of spreadtow. As I get additional info, layups, cost...etc I'll post in this thread. Wow, that sounds pretty exotic Graham - and reassuringly expensive too!!! Looking forward to hearing more about the design as details become available. Bugger the cost I'm having spread tow on mine. We are ready for standard production of Pitbull 2 now. Meantime the Pitbull 2 is tested by Lukas Gaubatz and it looks very promising, he likes the plane. Till now we received this feedback: "Pitbull 2 makes a lot of fun, turns tighter, can carry more weight and was in several testflights in 5m/s and 13m/s wind a bit faster than the Pitbull 1." Please note that it is not possible to easily exchange the parts (wings, fuselage, etc.) between Pitbull 1 and Pitbull 2. The conception of the new Pitbull 2 is different. The fuselage is made more slim for Pitbull 2. 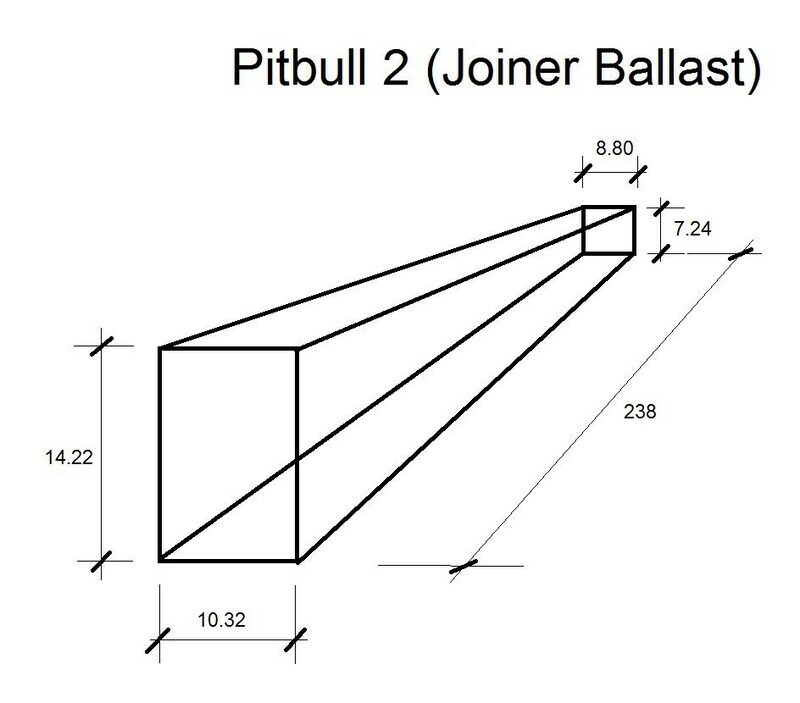 So there is not ballast tube in fuselage in Pitbull 2. Only ballast tubes in wings. But there is possibility to add ballast into wing joiners. Like it was done by some pilots already at Pitbull 1. We are considering to make and offer also ballast for joiner in future. At the moment I can only send you the picture with the size of the tool that we use to build the wing joiner. For ballast you must deduct from these dimensions about 0.5/0.75mm. Ballast system in wings is the same like for Pitbull or Jedi. Same size and weight. Attached please find 3-side view drawing. For the all F3F layups is used Herex in wings. Only for F3B layup is used Rohacell in wings. The F3F models does not include installed tow hook standardly. The tow hook could be installed if requested. Extra cost for tow hook installation is 20 Euro (inclusive price of hook). There is not ballast tube in fuselage in Pitbull 2. Only ballast tubes in wings. 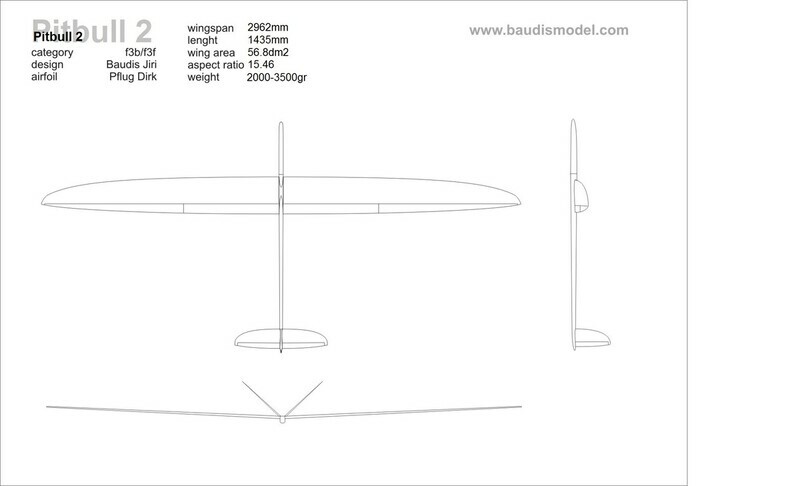 The Pitbull 2 is standardly delivered with LDS linkage for all wing surfaces (aileron and flaps). For fuselage could be used servos KST MS-320 or similar size servos. The price include all accessories for servo assembling (4 x LDS set, wirings, etc. ), carbon pushrods, servo covers, ballast set for wings. Protective wing bags for the entire model also included free of charge. RC equipment (receiver, servos, accus, etc.) is not included in the price. We also offer the complete finishing of the model (servo installation, cables installation) if requested. The cost for the all servos installation including cables (wiring) installation is 300 Euro (price of servos is not included). Possibly we can install only the all 4 wing servos. The price for the all wing servos installation is 200 Euro (price of servos is not included). There is not included wirings (cables) installation if we install only wing servos. Wing servos installed with LDS for ailerons and LDS for flaps. I'm having steel wing joins made. Expensive model. If you look at the pitbull2 layups equivalent to a shinto you have to pay for the lds to be installed on top, which makes it more than a shinto. Then you need a metal wing joiners or tungsten in top. And i thought shintos were pricey. As Greg said: "reassuringly expensive"! Installation price has gone up, too. I put my order in over a month ago! Even chose a colour scheme.